Advertisements cannot mislead the user, destroy, disrespect, resemble or pretend to be content. Advertisements must not contain strobing effects and rapid image sequences. Unclear, blurry, or unrecognisable ads are not allowed. All creative must be clear with legible text. Creatives with a partially black or white background must have a visible border of contrasting colour. Advertisements must be of sufficient quality – i.e. meeting professional design standards, using suitable image resolutions etc. Advertisements cannot contain graphics that simulate interactivity (i.e., drop down menus, search boxes, surveys/polls etc.) without that functionality actually existing. No fake or simulated HTML interactivity is permitted. SCA reserves the right to remove any advertisement that adversely affects the user experience of its sites. Creative that poses unreasonable load will be rejected. This includes but is not limited to excessive CPU and memory usage. Advertisements containing 3rd or 4th party cookies on SCA sites for re-targeting or any other user tracking purposes are not permitted without prior approval from SCA. Creative that features unauthorised connections to external servers for the purposes of user tracking will be removed. SCA reserves the right to preserve the user experience of its sites, and reserves the right to remove any advertisement which is deemed annoying and/or harmful to our users at any time. The sponsor of any advertising message appearing on the SCA sites must be clearly identified. All advertisements must link to a landing page only. 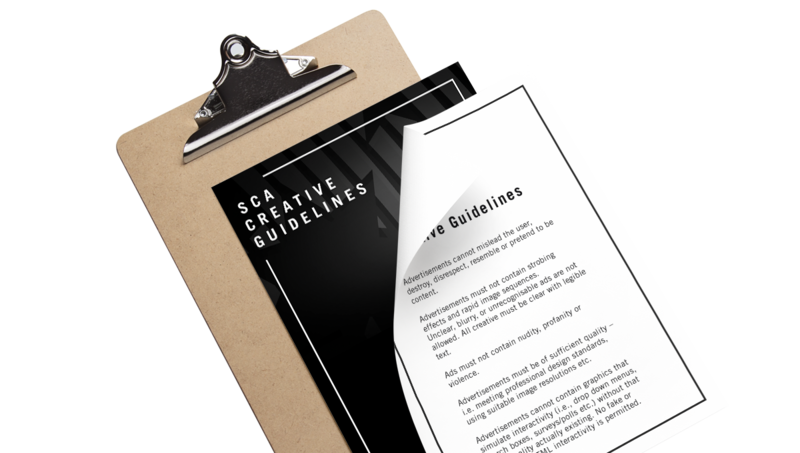 SCA does not permit the downloading of files directly from advertisements. All creative with a white background must include a border to distinguish between the website and the creative.